After endless days, weeks and months of planning your event has finally happened. Are your eyes open yet? Good! Hopefully you can take a day or two off, and enjoy some proper recovery time after all of your hard work event planning. Either way, as any event professional will tell you, there is still work to be done post-event. One of the best way to ensure a event marketing strategy with continued success is by utilizing post-event surveys. We’re all about unbiased feedback at G2 Crowd (you know, given it’s what our company is based on!) Our site offers reviews of event management software, but the need for customer feedback goes beyond software reviews -- right through to the event itself. This is where you need to make use of surveys following your event. Let's take a look at what post event survey questions are. Post event survey questions are used by event professionals to analyze an event's success. Event surveys unveil what went well, to replicate at future events, and what to change. Surveys should not be too long, can be done with paper and pencil, sent through email, or shared at the venue as part of an event app. 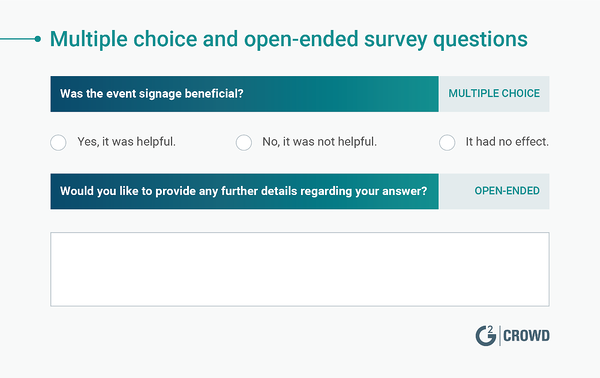 Post event survey questions can take various forms, including open-ended questions, Likert Scale questions, and multiple choice. Understanding what worked and what didn’t is crucial to making sure your event marketing strategy not only succeeds, but also improves. While it is presumed you will ask event attendees for feedback, they aren’t the only group who can give you guidance. If you worked with volunteers during your event, they are a great source to learn what worked and what didn’t. Whether it’s selling raffle tickets, scanning name badges, or assisting with registration, volunteers get face-to-face feedback from your guests. They can provide you with excellent information to improve processes at your next event. 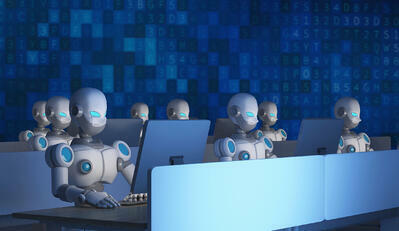 In the same way, they inform you of what worked, so that you can implement it as a standard event process. 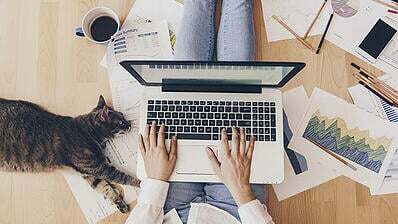 While you don’t need to send an actual survey to your volunteers, it’s worth sending them an email stating your thanks and asking if they have any feedback they’d like to give you. I’ve lost track of how many events I’ve volunteered at, but it’s been plenty. The list is long and includes events for kids, marketers, filmmakers, animals, theatres...you get the idea. It’s not often people ask for my feedback, but when they do I’m thankful for it. Sometimes I have feedback, sometimes I don’t, but it’s always nice to know that your opinion is valued! Just like event attendees, sponsors are also critical to your event’s success. With an understanding of that, it makes sense you want their feedback too! If you only have a few sponsors, a simple email or phone call asking for feedback works. On the other hand, if you have 10 or more sponsors, you can create a post-event survey for them. In addition to compiling the data, this gives your sponsors the benefit of anonymity. If you are doing something a sponsor doesn’t like, it’s important you know what it is – you want them to sponsor you again! Plus, sponsors are people too, and the importance of making people feel valued and appreciated can’t be taken for granted. Asking for feedback shows you value their input, keeping the relationship strong. The third group is, of course, the most obvious. Given these are the people you produced the event for, it makes sense you want to know about their experience. A positive experience at your event will result in positive feelings towards your brand. Plus, the same way you want repeat sponsors, you also want repeat guests! This is a huge part of a successful event marketing strategy. attendees aren’t happy, they won’t come back, making your continued event marketing success much more challenging. Like any other marketing activity, your post-event survey should begin by assessing the goals. Why are you doing this survey – what do you want to achieve from it? What worked, what didn’t, and why? You want to know what worked, so that you can repeat it, and what didn’t, so you can fix it. “What worked, what didn’t, and why,” is a mantra I learned in acting, and it doesn’t just apply to events. These are the “favorites.” What were the biggest successes of your event? These are the parts which got your guests excited! Hopefully, these will also be the points your guests go home and tell friends and coworkers about, causing them to attend your next event! These are the “least favorites.” While not as fun to read, this is the part which will help you see the most long-term success in your event management. In order to improve your event marketing strategy, you need to move forward. And how can you move forward, and get better, if you don’t know what to change? Every event will have positives and negatives – that’s just the way it works. This is especially true given that events are an experience, and your guests will each live the event through their own personal lens. But using your post event survey questions to satisfaction enables you to quantify your event’s success as a whole. And, you are measuring that success in the eyes of those who matter most -- your attendees. 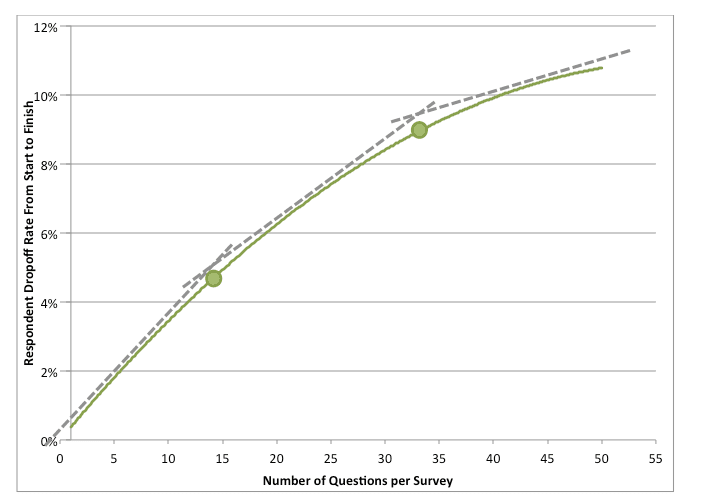 Include event survey questions that give numerical results that can be objectively measured. For example, simply ask guests to rate their satisfaction, or how likely they are to recommend the event to a friend. Now that you know who you will seek feedback from, let’s talk about what you are going to ask them. There are many cheap (or even FREE!) survey software providers. These tools enable you to write your survey questions, send a survey link to guests, and view the results. 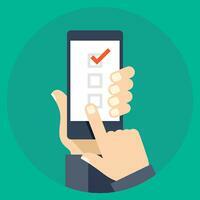 Mobile event apps also provide survey features. These apps enable attendees to share their feedback on the event day, often immediately following speaker sessions. As you peruse each of the three lists, please note you should NOT use every question here! In addition, it’s worth noting that event survey questions are sent after the event, or at least the event, has finished. This is especially the case for corporate event planning, executed as part of a B2B marketing strategy. Be sure to adjust any necessary wording to be past-tense. Open-ended questions are the closest you can get to a regular conversation. Where other survey questions have a list of potential answers to choose from, these questions are just what they say: open-ended. Survey respondents can say anything and everything on their mind! Remember that your open-ended questions should be limited – don’t ask too many! In addition to taking longer for your guests to answer, you can’t quantify the results. Despite this, they are incredibly useful and should be included somewhere in your survey! Are there any suggestions you have for next year’s event? Were there any parts of the conference that you found especially useful? What was your least favorite part of this event? Will this event help further your career/your team’s goals/your company’s ROI? If so, how? Do you have any topic or speaker suggestions for future events? How will this conference improve your work? How can we make this conference better? Any other comments or feedback? Notice that I asked, “Will this event help further your goals? If so, how?” It is essential you do not make presumptions or ask any leading questions. While you hope your event had a positive impact, you can’t make that assumption. Likert scale questions give your respondents a scale on which they can rate how much they agree or disagree with a statement. For example, you could ask, “On a scale from 1 to 5, how satisfied are you with this event?” The ranking is usually done on a scale from 1-to-5 or 1-to-7. It’s good to have an odd number so you have a clear middle point. Notice how in this example from Research Now, the explanation of “1 - Not at all important” and “5 - Extremely important” is right there where the questions are being answered. Without specifying if “1” means good or bad, you will end up with data that is meaningless. You have no way of knowing what your guests think; that’s exactly like playing a card game without specifying if an ace is high or low! Here is a list of questions you can use with a Likert Scale or "rating" format. In the first one, I’ve given an example of how you can include wording for which side is high and which is low. How likely are you to recommend this conference to a friend or coworker? How likely are you to attend this conference again next year? How would you rate the value of this conference? How beneficial was the information presented at this event? How much will this event positively impact execution of your job? How satisfied were you with the event’s agenda? How would you rate the catering? How would you rate the venue? How do you rate the overall quality of the speakers? Overall, how satisfied were you with this event? How would you rate the quality of the networking at this event? How likely are you to attend our other events? As shown as in the image above, you can also create a matrix, or a grid, to ask participants to rate multiple factors within the same question. Here is an example with some additional post-event questions. By putting the questions all together, into one grid, it makes your survey more consolated and feels shorter than eight separate questions. Plus, beginning eight questions in a row with “On a scale from 1 to 5” feels more than a little redundant! These are questions in which you give attendees a specific answer to choose. It could be multiple choice, in which they select the best-fitting answer, or “choose all that apply,” in which they can tick as many boxes as are relevant. How did you first hear about the conference? Have you attended this conference before? Have you attended any of our other events before? Did the conference meet your expectations? How did you learn about the conference? Which sponsors do you remember from the event? How satisfied were you with the agenda for the day? What factors determine your decision to attend conferences and other professional development? Were the date and time convenient for you? Who was your favorite speaker? Were the sessions the right length? Did you have enough time for Q&A at the end of each presentation? Demographics questions - title, industry, etc. In this situation, you’ve given guests the ability to provide a quick answer by selecting an option if they are short on time. This also gives you a straightforward way to measure if your event signage served its purpose. Thinking about “What worked, what didn’t, and why,” the “yes” and “no” questions are finding out if the signage worked or not. Hopefully the open-ended follow-up question will give you insight into the “why”! Now that you understand the kind of survey questions you can choose from (and have examples of those questions! ), let’s look at putting it all together. 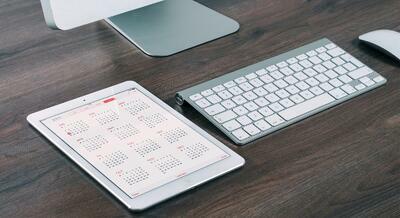 Here are the top three points to keep in mind when compiling your event survey questions. Required questions are great in theory. The danger is when you want to know everything, you make everything required. By doing this, you can lose respondents in two ways. The first is if your survey is too long. (Given that survey length is so crucial, I’ll discuss that more in the next paragraph!) If an event guest begins to take your survey and then runs out of time, you can at least let them submit the answers they have completed. The second problem comes when you require attendees to answer a question when they legitimately don’t have an answer. For example, if you require guests to rate every speaker on a scale from 1-to-5, and Sarah had to take a phone call and missed speaker number three, what score is she supposed to give them? This is my biggest pet peeve when I’m taking surveys! Aside from frustrating respondents, required questions can lead to inaccurate data, which does nothing to help you! Whenever you make survey questions required, create an “N/A” (not applicable) option. Then guests can at least be honest if something didn’t apply to them! While you don’t want to make every question required, It’s worth noting there are some benefits. 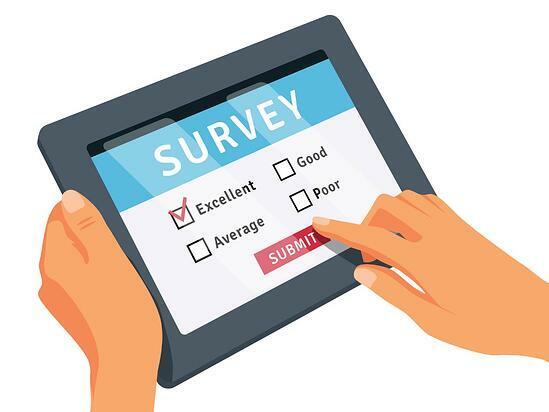 For example, if you are incentivizing your survey, it is fair that you want guests to have actually given you feedback – not an entire survey of blank answers. Find a happy medium: Choose some required questions, but not all of them. This will help your respondents speed up the process if they don’t have time for open-ended questions, and ensure you get the answers which matter to you most. As advised by Survey Monkey, think about the value for each question you add, as each one could lose another person completing your survey. SurveyAnyplace recommends keeping your survey length to a maximum of 15 questions, and ideally 10. 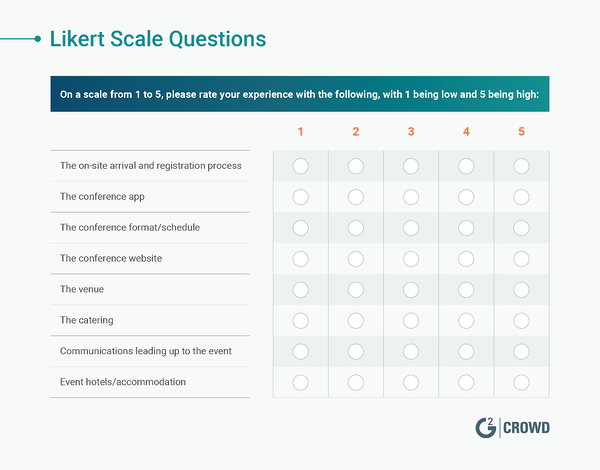 If your survey is short and sweet, let your event guests know. Including “short seven-minute survey”in the email subject (or bolded in the body copy! ), can help increase the respondent rate. Just make sure that time length is honest and accurate! Many surveys are incentivized, meaning people who take them get something, or the chance to win something. Some people are willing to give feedback but struggle because of a lengthy to-do list. The chance to win an Amazon gift card might just push them over the edge for giving you five minutes of their time. The only negative to watch out for? Some people will care more about the gift card then sharing legitimate feedback. In my experience executing surveys that has never been a problem though! If you don’t have the budget for gift cards, you could think about offering a discount to your next event, or the opportunity to give away a free pass to next year’s conference. I went to the B2B Marketing Forum in 2017, run by MarketingProfs, who utilized its event app for surveys following each session. The app had a mini-survey for every speaker session you attended, and for each mini-survey filled out you had the opportunity to win a gift card. And guess what? I did. Every. Single. Survey. Sadly I didn’t win, but I don’t regret trying! Like so many areas of life, creating surveys gets easier with practice. You will not only discover “What worked, what didn’t and why” in your events, you’ll also learn what worked in the creation and execution of your surveys! Once you create and send your survey, you can’t forget the final step: actually reading those responses! It goes without saying; a survey is pointless if you don’t choose to listen and learn from the feedback. 1. Look for ways to improve your event, then take action. Take a look at the open-ended questions, and seek any relevant feedback. You could discover suggestions that are easy to tweak for your next event, elevating it to the next level. A guest may also suggest an amazing speaker for next time. Be sure to quantify your other questions. If you have an element that has a consistently low rating, you know where to put your efforts for your next event! Addressing these items will help your guests know you listen to them and are committed to giving them the best experience possible. Be open to the feedback, even when it’s not what you want to hear. If you aren’t, you could let a small problem (which could have been easily fixed!) turn into a deal-breaker, and cost you future attendees. Okay sure, you could also have a few grouchy guests who are going to give you negative feedback. Some people just look for things to be unhappy about. Usually, these people stand out in their responses. Even then, try to get past the negativity and consider the parts of their feedback that are valid. And I do hope you won’t have too many of those at your event! 2. Find what’s working and stay consistent. Take the time to feel good about what went well. When people are happy, keep that momentum! You might have found a venue your guests all love. If that’s the case, you can re-book the space for the following year. Woo hoo! One step of the planning process ticked off of your list! Oh yes, and give yourself a pat on the back. After all of your hard work, you’ve earned it! Feedback can be hard. (Okay, I admit it: really hard.) We don’t like to hear criticism, because it means admitting mistakes. This is especially difficult when you’ve put your heart and soul (and endless hours!) into anything – including your events. Positive feedback is great. Who doesn’t love hearing you did well? It feels good to know all of your hard work has paid off. However, you can’t get overconfident, or let it go to your head. You must include a post event survey as part of your event planning checklist. It’s not easy to be honest and accurate when assessing our own successes and learnings. That’s what surveys are there for! Execute your surveys with the confidence you’ve put all you could into a great event, and the peace of mind you will continue learning and improving. 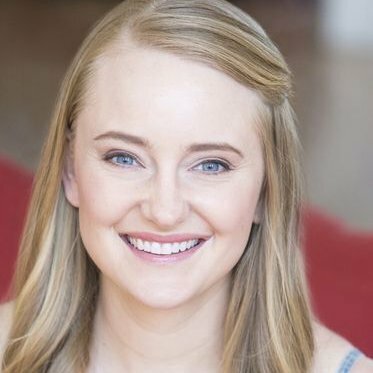 Kristen is a Senior Content Marketing Specialist who loves writing and sharing stories about top-notch marketing. When she isn’t writing, Kristen is all about performing or anything related to her dog, Bella, who may or may not have a whole bunch of virtual doggy friendships on Instagram.